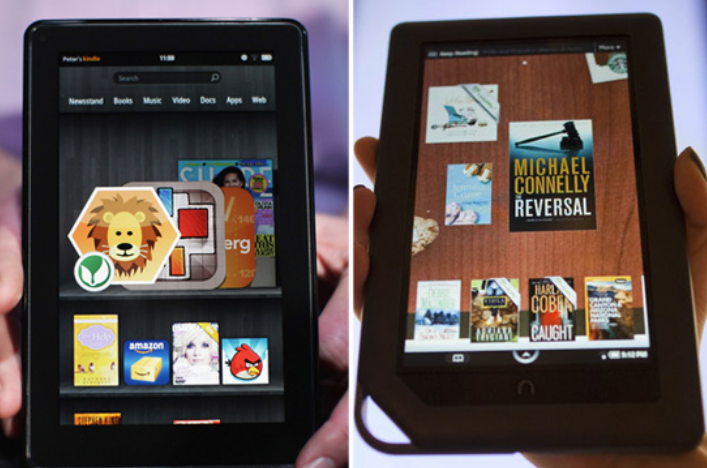 Kindle Fire and Nook Tablet weighed-in, what's the better deal? Amazon and Barnes &Noble once again heats up the competition as they take the market battle to the Tablet Department. Barnes & Noble will begin the pre-order for the Nook Tablet on November 7, to be followed by its release in November 16. However, the Kindle Fire will be released by Amazon a day earlier. So the clash between parties begins. And to ease the tension, let us try to queue up the pros and cons to help you decide which tablet is a better deal as the portable e-Reader slash Tablet machine. Kindle Fire will sell $49 less than the Nook Tablet. Being a promotional tablet of Amazon, Kindle Fire is Priced at $200, while its Barnes & Noble counterpart will sell $249. Kindle Fire and Nook Tablet will be framed in a 7-incher touchscreen display at 1024x600 resolution. Nook Tablet grabs the notch in the clocking speed with 1.2GHz dual-core processor, while Kindle Fire only runs in 1GHz dual-core. But we think that this’ll not have a considerable effect of the KF’s side. Nook also leads in storage as it comes in 16GB on-board space, expandable up to 32 GB SD card. On the other hand, Kindle Fire is only limited with 8GB. However, Kindle Fire is integrated with Amazon’s free cloud service so data storage here is not an issue. Both tablet can stream music, videos and books which came from their respective sources. Kindle Fire will solely be hooked up with Amazon Prime’s online store; while Nook Tablet would get contents from Hulu Plus, Netflix and Pandora. Grabbing the Kindle Fire though will give customers a 30-day Amazon Prime membership. However it comes with $79 price tag per year. In line with Books, customers can choose from Barnes & Noble and Amazon for their selections. But the main reason of getting a Kindle Fire is the overflowing fun and familiar apps offered by Amazon. Amazon’s new Silk Web browser may also be the deal maker due to its capability of reducing the download time in half due to its dual cache system. However, Android fanatics will like Nook tablet. But, those who are planning to have a long time subscription in Hulu Plus and Netflix may find themselves spending more than the $79-worth of Amazon Prime. It is due to the fact that Amazon Plus offers unlimited streaming of movies and TV shows with rental prices starting at $ 1.99 only. Speaking of Hardware terms, both Tablets may be at par with each other. It is in the deals the deals with Amazon Prime integration that makes the Kindle Fire a better deal. Price is also one of the factor and the unlimited storage in Amazon Cloud. Pinoy Metro Geek: Kindle Fire and Nook Tablet weighed-in, what's the better deal?